Return on Equity (ROE) is a measure of a company’s annual return (net incomeNet IncomeNet Income is a key line item, not only in the income statement, but in all three core financial statements. While it is arrived at through the income statement, the net profit is also used in both the balance sheet and the cash flow statement.) divided by the value of its total shareholders’ equityStockholders EquityStockholders Equity (also known as Shareholders Equity) is an account on a company's balance sheet that consists of share capital plus retained earnings. It also represents the residual value of assets minus liabilities. By rearranging the original accounting equation, we get Stockholders Equity = Assets – Liabilities, expressed as a percentage (e.g., 12%). 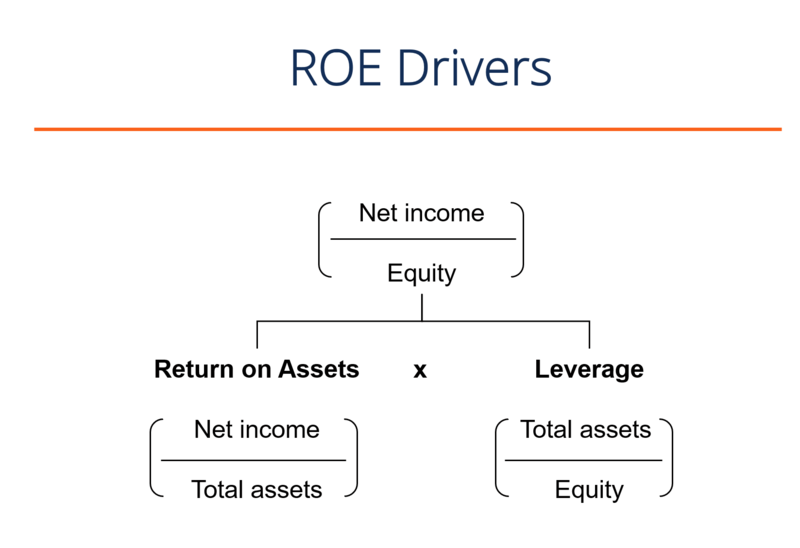 Alternatively, ROE can also be derived by dividing the firm’s dividend growth rate by its earnings retention rate (1 – dividend payout ratioDividend Payout RatioDividend Payout Ratio is the amount of dividends paid to shareholders in relation to the total amount of net income generated by a company. The dividend payout ratio measures the percentage of net income that is distributed to shareholders in the form of dividends. Learn the dividend payout ratio formula). Return on Equity is a two-part ratio in its derivation because it brings together the income statement and the balance sheetBalance SheetThe balance sheet is one of the three fundamental financial statements. These statements are key to both financial modeling and accounting. The balance sheet displays the company’s total assets, and how these assets are financed, through either debt or equity. Assets = Liabilities + Equity, where net income or profit is compared to the shareholders’ equity. The number represents the total return on equity capital and shows the firm’s ability to turn assetsTypes of AssetsCommon types of assets include: current, non-current, physical, intangible, operating and non-operating. Correctly identifying and classifying the types of assets is critical to the survival of a company, specifically its solvency and risk. An asset is a resource controlled by a company which future economic benefit into profits. To put it another way, it measures the profits made for each dollar from shareholders’ equity. ROE provides a simple metric for evaluating returns. By comparing a company’s ROE to the industry’s average, something may be pinpointed about the company’s competitive advantageCompetitive AdvantageA competitive advantage is an attribute that allows a company to outperform its competitors. Competitive advantages allow a company to achieve. ROE may also provide insight into how the company management is using the financing from equity to grow the business. A sustainable and increasing ROE over time can mean a company is good at generating shareholder valueShareholder ValueShareholder value is the financial worth owners of a business receive for owning shares in the company. An increase in shareholder value is created with a company earns a return on invested capital greater than its weighted average cost of capital. Value is created when the business performs better than expected because it knows how to reinvest its earnings wisely, so as to increase productivity and profits. In contrast, a declining ROE can mean that management is making poor decisions on reinvesting capital in unproductive assets. 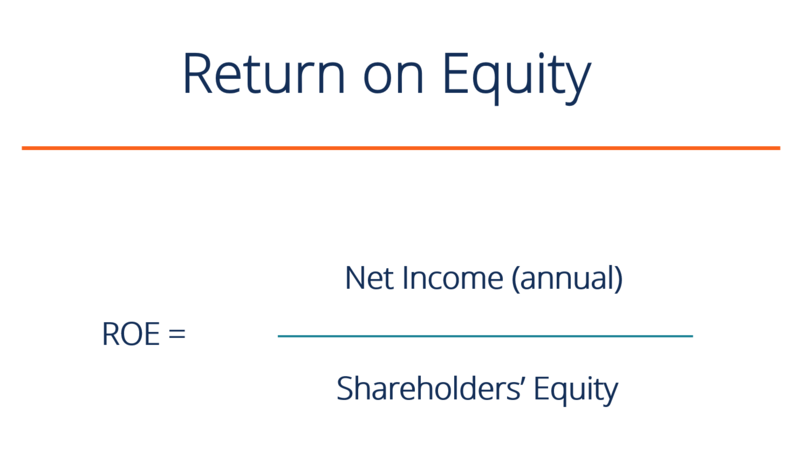 While the simple return on equity formula is net income divided by shareholder’s equity, we can break it down further into additional drivers. As you can see in the diagram below, the return on equity formula is also a function of a firm’s return on assets (ROA)Return on Assets & ROA FormulaReturn on assets (ROA), a form of return on investment, measures the profitability of a business in relation to its total assets. The ROA formula is used to indicate how well a company is performing by comparing the profit it's generating to the capital it's invested in assets. The higher the return, the more and the amount of financial leverageFinancial LeverageFinancial leverage refers to the amount of borrowed money used to purchase an asset with the expectation that the income from the new asset will exceed the cost of borrowing. In most cases, the provider of the debt will put a limit on how much risk it is ready to take and indicate a limit on the extent of the leverage it has. Both of these concepts will be discussed in more detail below. Learn more in CFI’s Financial Analysis Fundamentals Course. With net income in the numerator, Return on Equity (ROE) looks at the firm’s bottom line to gauge overall profitability for the firm’s owners and investors. Stockholders are at the bottom of the pecking order of a firm’s capital structureCapital StructureCapital Structure refers to the amount of debt and/or equity employed by a firm to fund its operations and finance its assets. The structure is typically expressed as a debt-to-equity or debt-to-capital ratio. Debt and equity capital are used to fund a business’ operations, capital expenditures, acquisitions,, and the income returned to them is a useful measure that represents excess profits that remain after paying mandatory obligations and reinvesting in the business. Why Use the Return on Equity Metric? Simply put, with ROE, investors can see if they’re getting a good return on their money, while a company can evaluate how efficiently they’re utilizing the firm’s equity. ROE must be compared to the historical ROEs of the company and to the industry’s ROE average – it means little if merely looked at in isolation. Other financial ratiosFinancial RatiosFinancial ratios are created with the use of numerical values taken from financial statements to gain meaningful information about a company. The numbers found on a company’s financial statements – balance sheet, income statement, and cash flow statement are used to perform quantitative analysis and assess a company's liquidity, leverage, growth can be looked at to get a more complete and informed picture of the company for evaluation purposes. In order to satisfy investors, a company should be able to generate a higher ROE than the return available from a lower risk investment. A high ROE could mean a company is more successful in generating profit internally. However, it doesn’t fully show the risk associated with that return. A company may rely heavily on debtLong Term DebtLong Term Debt (LTD) is any amount of outstanding debt a company holds that has a maturity of 12 months or longer. It is classified as a non-current liability on the company’s balance sheet. The time to maturity for LTD can range anywhere from 12 months to 30+ years and the types of debt can include bonds, mortgages to generate a higher net profit, thereby boosting the ROE higher. As an example, if a company has $150,000 in equity and $850,000 in debt, then the total capital employed is $1,000,000. This is the same number of total assets employed. At 5%, it will cost $42,000 to service that debt, annually. If the company manages to increase its profits before interest to a 12% return on capital employed (ROCE)Return on Capital Employed (ROCE)Return on capital employed (ROCE), a profitability ratio, measures how efficiently a company is using its capital. Simply put, ROCE measures how well a company is using its capital to generate profits. The return on capital employed is considered one of the best profitability ratios and is commonly used by investors to, the remaining profit after paying the interest is $78,000, which will increase equity by more than 50%, assuming the profit generated gets reinvested back. As we can see, the effect of debt is to magnify the return on equity. The image below from CFI’s Financial Analysis Course shows how leverage increases equity returns. The return on equity ratio can also be skewed by share buybacksDividend vs Share Buyback/RepurchaseShareholders invest in publicly traded companies for capital appreciation and income. There are two main ways in which a company returns profits to its shareholders – Cash Dividends and Share Buybacks. The reasons behind the strategic decision on dividend vs share buyback differ from company to company. When management repurchases its shares from the marketplace, this reduces the number of outstanding sharesWeighted Average Shares OutstandingWeighted average shares outstanding refers to the number of shares of a company calculated after adjusting for changes in the share capital over a reporting period. The number of weighted average shares outstanding is used in calculating metrics such as Earnings per Share (EPS) on a company's financial statements. Thus, ROE increases as the denominator shrinks. Another weakness is that some ROE ratios may exclude intangible assets from shareholders’ equity. Intangible assetsIntangible AssetsAccording to the IFRS, intangible assets are identifiable, non-monetary assets without physical substance. Like all assets, intangible assets are those that are expected to generate economic returns for the company in the future. As a long-term asset, this expectation extends for more than one year are non-monetary items such as goodwillGoodwillIn accounting, goodwill is an intangible asset. The concept of goodwill comes into play when a company looking to acquire another company is willing to pay a price significantly higher than the fair market value of the company’s net assets. The elements that make up the intangible asset of goodwill, trademarks, copyrights, and patents. This can make calculations misleading and difficult to compare to other firms that have chosen to include intangible assets. Finally, the ratio includes some variations on its composition, and there may be some disagreements between analysts. For example, the shareholders’ equity can either be the beginning number, ending number, or the average of the two, while Net Income may be substituted for EBITDAEBITDAEBITDA or Earnings Before Interest, Tax, Depreciation, Amortization is a company's profits before any of these net deductions are made. EBITDA focuses on the operating decisions of a business because it looks at the business’ profitability from core operations before the impact of capital structure. Formula, examples and EBITEBIT GuideEBIT stands for Earnings Before Interest and Taxes and is one of the last subtotals in the income statement before net income. EBIT is also sometimes referred to as operating income and is called this because it's found by deducting all operating expenses (production and non-production costs) from sales revenue., and can be adjusted or not for non-recurring itemsNon-Recurring ItemIn accounting, a non-recurring item is an infrequent or abnormal gain or loss that is reported in the company’s financial statements. Unlike other items. Some industries tend to achieve higher ROEs than others, and therefore, ROE is most useful when comparing companies within the same industry. Cyclical industries tend to generate higher ROEs than defensive industries, which is due to the different risk characteristics attributable to them. A riskier firm will demand a higher cost of capital and a higher cost of equity. Furthermore, it is useful to compare a firm’s ROE to its cost of equityCost of EquityCost of Equity is the rate of return a shareholder requires for investing in a business. The rate of return required is based on the level of risk associated with the investment, which is measured as the historical volatility of returns. Learn the cost of equity formula with examples and download the Excel calculator. A firm that has earned a return on equity higher than its cost of equity has added value and vice versa. The stock of a firm with a 20% ROE will generally cost twice as much as one with a 10% ROE (all else being equal). DuPont AnalysisIn the 1920s, the management at DuPont Corporation developed a model called DuPont Analysis for a detailed assessment of the company’s profitability. DuPont Analysis is a tool that may help us to avoid misleading conclusions regarding a company’s profitability. If the net profit margin increases over time, then the firm is managing its operating and financial expenses well and the ROE should also increase over time. If the asset turnover increases, the firm is utilizing its assets efficiently, generating more sales per dollar of assets owned. Lastly, if the firm’s financial leverage increases, the firm can deploy the debt capital to magnify returns. DuPont analysis is covered in detail in CFI’s Financial Analysis Fundamentals Course. Below is a video explanation of the various drivers that contribute to a firm’s return on equity. Learn how the formula works in this short tutorial, or check out the full Financial Analysis Course! 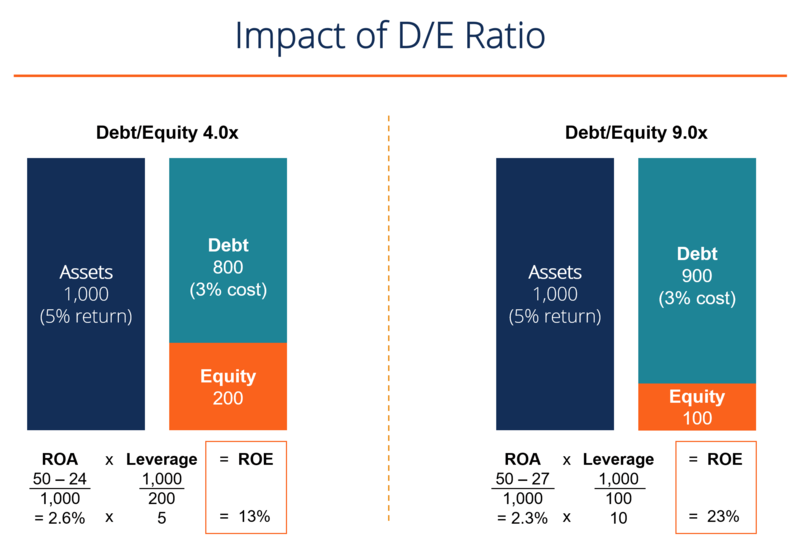 While debt financing can be used to boost ROE, it is important to keep in mind that overleveraging has a negative impact in the form of high-interest payments and increased risk of defaultDebt DefaultA debt default happens when a borrower fails to pay his or her loan at the time it is due. The time a default happens varies, depending on the terms agreed upon by the creditor and the borrower. Some loans default after missing one payment, while others default only after three or more payments are missed.. The market may demand a higher cost of equity, putting pressure on the firm’s valuationValuation PrinciplesThe following are the key valuation principles that business owners who want to create value in their business must know. Business valuation involves the. While debt typically carries a lower cost than equity and offers the benefit of tax shieldsTax ShieldA Tax Shield is an allowable deduction from taxable income that results in a reduction of taxes owed. The value of these shields depends on the effective tax rate for the corporation or individual. Common expenses that are deductible include depreciation, amortization, mortgage payments and interest expense, the most value is created when a firm finds its optimal capital structure that balances the risks and rewards of financial leverage. Furthermore, it is important to keep in mind that ROE is a ratio, and the firm can take actions such as asset write-downsImpairmentThe impairment of a fixed asset can be described as an abrupt decrease in fair value due to physical damage, changes in existing laws creating a permanent and share repurchasesShare RepurchaseA share repurchase refers to when the management of a public company decides to buy back company shares that were previously sold to the public. There are several reasons why a company may decide to repurchase its shares. For instance, a company may want to send a market signal that its stock price is likely to increase to artificially boost ROE by decreasing total shareholders’ equity (the denominator).